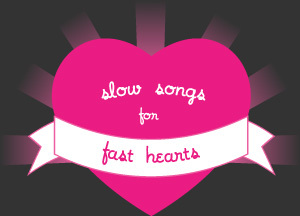 Slow Songs For Fast Hearts: A pretty long story about why I like what I do. A pretty long story about why I like what I do. It got me thinking how much my musical tastes have changed and changed back over the course of my life so far, and also the political connotations that have shaped those changes, unnoticed by me at the time. My primary school & high school in Auckland were populated pretty much solely by kids who were into rap and R&B, and most of us were Maori/Pacific Island/Indian/Asian/mixed. There were very few Pakeha (NZ European) kids at those schools, and most of them listened to rap & R&B too, but the few who didn’t were known as “metalers”, and they were always kind of apart from the rest of the school, shrouded in a mystery of long, stringy hair, eyeliner & Iron Maiden tshirts. Apart from my best friend who had the knack of mixing and mingling with all sorts of “weird” people, (and got the flack for it too now and then), none of us had much to do with those kids. I remember when Kurt Cobain died when I was around 14/15 and my friend came to school crying about it, and we were all like, “who? who cares about some white dude “metaler” anyway?” A friend of my parents’ asked me about Kurt’s death, saying he heard on the radio Kurt being called the biggest rock star of his generation, and I snottily said, “well, I’ve never heard of him, so I doubt it!”. I love the idea of that now, surrounded as I am by magazines and media that take for granted that Kurt was the most important star of his generation, that me & my friends had no clue who he was, during Nirvana’s heyday. No doubt, kids who are going to school & growing up in similar situations today still don’t have a clue who Kurt is, and don’t care either. I was genuinely obsessed with rap & R&B. A few of my favourite songs included MC Lyte’s “Ruffneck”, TLC’s “Hat 2 da Back”, Aaliyah’s “Back & Forth”, and I was really into Snoop (Doggy) Dogg, R Kelly, Monie Love, Salt n Pepa, Dr Dre – I dunno, this is a random collection of songs and groups, but if you were around then too, then you probably get the picture. I didn’t get guitar based music at all. My parents and their friends were Led Zeppelin, Pink Floyd, Bob Dylan, The Who etc fans, so it’s not as though I wasn’t exposed to guitar music. They were pretty confused about my taste, my Dad regularly stating that it wasn’t “real music” (I’m sure he’s changed his mind now, right Dad? ), and his favourite rock radio station having the self-promotional ad “no rap – no crap” playing at regular intervals. My feeling is that hip hop is still the most rebellious form of music, even if the lyrics & the presentation are not always so, because it’s generally on the cutting edge, and most old people have a hard time understanding its value at first, while the kids get it immediately. Anyway, when I was around 16, my cousins came up to stay and inevitabley brought Nirvana tapes with them. And then “alternative” music was suddenly all I listened to. (Much to the annoyance of my best friend no doubt, who had spent her years fighting for her right to like “white” music). My sister was into hip hop at that point, and I would be like “oh my god, that music is so sexist, it’s so pop-py, it sux!” (for some reason my sister was always able to keep way more of an open mind than me, so listened to alternative music AND hip hop). My music tastes kind of stuck around these kinds of genres for a few years, and coincided with my burgeoning feminist consciousness, and going to University. At uni I was no longer hanging out with many people of colour, my friends from school mostly disappearing down other paths. Suddenly I was in classrooms with a lot of students who’d gone to private schools and had “sophisticated” tastes, and a penchant for taking the piss out of South Auckland. This led to me completely denying my past musical tastes, it just wasn’t “cool” to be into gangsta rap or whatever any more, and I felt pretty embarrassed about my former high school persona, had total cutural cringe (even my accent changed). Riot grrrl appeared in my life around the age of 20, and race politics began to nag at the back of my mind, vying for position with the mostly “white” feminism & queer theory that I’d encountered up til then. But it really wasn’t til my mid 20s that I started to re-visit the music of “my youth” and only really super recently that I started listening to current hip hop. I worked for 7 years in a youth library/drop in centre/hang out place in an area similar to the ones my old schools had been in. I watched the kids plug their stereos into the outdoor plugs and krump, do the soulja boy dance, free-style MC etc. We had a radio put in so that music constantly played throughout the library. I got obsessed with Lil Wayne & T.I. I suddenly noticed that after work, when I went home to the inner city and attended queer, mostly white club nights, they were playing Soulja Boy, Outkast and the like in an “ironic” and knowing way, using faux-gangsta DJ names that struck me as completely ridiculous and offensive considering I’d just spent my entire day surrounded by kids who lived and breathed it. This was what I’d been trying to conform with when I was at Uni? Jesus. One of the most noticeable things was that there were only ever a handful of people of colour at these events, and if someone walked in who looked too gangsta, or too suburban, or just too un-artschool, it’d be a pretty awkward moment for all concerned. In the last few years I’ve met friends who are (genuinely) into Bikini Kill, Bauhaus & R Kelly. Who are irritated also by the rich kids trying on being gangsta. I met friends who lived in the inner city but who had came from schools like mine, maybe had similar music histories and quandries. There was of course the Coolies, from South Auckland and yet riot grrrl. And other artists who cross over racial and musical boundaries: MIA who is Sri Lankan and has worked with Elastica and Peaches, and is also sampled in songs by Jay Z. I found out Neneh Cherry used to sing back up for the Slits. Yo Majesty who are black lesbian hip hop artists. Heard about ESG, young black women who became important players in the arty no wave/post punk scene. The Gossip covering “Are you that Someone” by Aaliyah is just crazy and amazing (I remember looking around the crowd during their Auckland show wondering who else knew the lyrics, like, remembered them from high school). I don’t really know what all this means, except perhaps I am now more comfortable about my own tastes, and know how to access what I like. What I listen to now is less dictated by people around me, and I have become more critical. I think the history of my musical tastes also has to do with being mixed race, and going between different worlds, different classes & races constantly, and when I was younger, I think the drive to fit in was stronger than it is now cos back then I was still coming to terms with “what” I was. There were plenty of times in my life when I wanted to deny aspects of my background in order to seem more like the people around me, and I think that also shows up in the rejection of music I used to like, once each new chapter of my life began. Anyway, things are different for me now, and I’m pretty pleased with the place that it’s brought me to today, and I can go record shopping and come out with armfuls of stuff that reflect all the different times in my life, and all the people I have been.